If you are already promoting your business on social media and want to have better results, Zoniz can help you kick it up a notch. With pre-built campaigns, promotion templates and website integration Zoniz will save you time and money while helping you reach your business goals. Knowing when and what to post can make a big difference in capturing your audience’s attention. You want your every post to make an impact and look great and that can be difficult when you run out of ideas or you depend on designers and developers. Zoniz offers you a complete library of pre-built image and text messages for all social media networks for every situation and time of day. You can easily customize them and schedule them so they best fit your business goals and brand image. Everything from one easy to use interface. Interact with your audience with special offers, customized Facebook applications and interactive pages. Create and publish promotions across mobile devices and social networks to drive real business results. Zoniz offers flexibility for businesses to use pre-built templates to get campaigns published quickly and cost-effectively, or design pages from scratch for a totally custom experience. 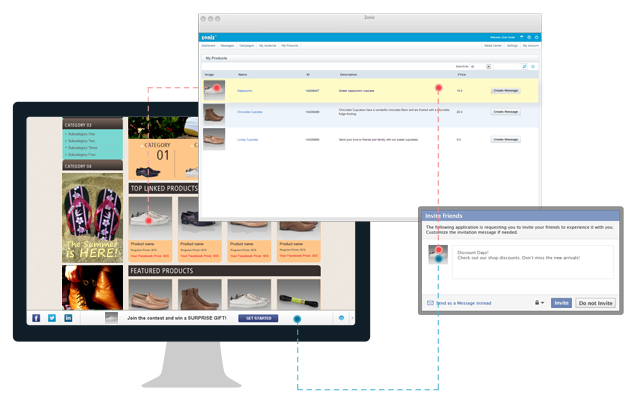 Connect your online shop to Zoniz and create promotions for your products and services directly from our interface. You can take the photo and details of your products and apply discounts, free shipping and other offers using our pre-built templates. Break further than social networks, with Zoniz you can bring your promotions to your website or online shop using Zoniz Toolbar. This way, you will never have to see your customers leaving your website to register to a promotion on a different page, they can do it there, on the spot and continue shopping and spend more time on your website. Send emails to everyone or filter your audience so you’ll reach the exact people you want. Using our newsletter templates just enter the message you want to send and you are ready to go. As with every feature of Zoniz, everything is pre-build, easy to customize to best fit your brand image and it will look great on mobile devices, too. Our support team is here to help. Whether you have questions about certain features, or need technical support our support line is always opened. Zoniz also offers one to one training sessions to get you started and make sure you are getting great results from your social media campaigns. © Copyright 2013 Zoniz™ - Social Marketing Platform.